Coaxing kids to take their medication can sometimes be difficult at best. Kids may completely clam up their mouths and obstinately refuse to take their medicine. If your child is quite sick he or she may be particularly irritable and finicky, which means that getting cooperation will be a major challenge. Children who have chronic conditions can pose additional problems because taking medication becomes a dreaded event for your child and medication time subsequently becomes a source of frustration for you. For very small children or infants, a helpful way to administer medications safely and effectively is by using a dropper or medication dosage syringe. The medicine is basically squirted into your child's mouth, near the back, and he or she will not be as likely to notice the taste or spit the medication out. If your child sees intense worry or fear on your face, it can make medicine administration much more frightening and difficult for your child. Try to smile and maintain a pleasant and warm voice. Tone can really affect young children and by using a gentle and encouraging tone, your child is more likely to respond favourably to medication time. A bad tasting medicine is a sure-fire way to leave your child groaning and cringing when you try to administer the medication. Whenever possible, choose medicines that have an appealing flavour which is tailored for kids, as this can make a huge difference in how receptive your child is during medication time. Unfortunately, you won't always have a choice and you will need to administer a medication that have a poor taste. Compounding pharmacies are helpful because they can add a pleasant and palatable flavour to medicines; often fruit flavours are popular with kids and you can choose the preferred one for your child's taste buds. If the medicine doesn't have any warnings with regards to food or beverage interactions, you will usually be free to offer a favourite food or drink to your child, which can be taken immediately after the medication is ingested to remove the unpleasant taste. Try not to actually put medication in the food or beverage itself. Your child may not be able to finish all of the food or drink and if the medication is particularly unpleasant tasting, he or she may associate the medication with the food item and will continue to avoid that food, even when it isn't mixed with the medication. As with adult medications, read labels carefully and take note of the dosage as well as the frequency. Many medications will also list a maximum dose per 24-hour time period. Children aren't always forthcoming with side effect complaints, so be on the lookout for side effects and ask your child how he or she is feeling. Where possible, do try to select a flavoured liquid or chewable tablet as opposed to simply a capsule or tablet. 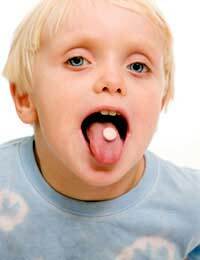 Kids can struggle to swallow large pills and chewable medicines are often more convenient and enjoyable for children to consume. Whenever you can, it's also helpful to let your child have some choices. Allow your child to select a spoon and a food or beverage to take with the medication. When shopping for an over-the-counter medication, try to let your child select the one with a favourite flavour or colour. Another useful practice is to explain to your child why the medication is important and how it can help him or her to feel better. Kids can be much more willing to take medicine when they realise it can get rid of their pain and discomfort. Suppositories are another option but this can depend on the child; some children will kick and scream at the idea of a suppository while others find it much easier and more comfortable than a foul tasting liquid. Consider suppositories as an option to try; if unsuccessful, don't dwell on it and move on to another strategy. It's a simple thing but affection and warmth can make all the difference in administering medications to children. Give your child a hug and acknowledge that it's not always easy to take medicines but still explain how they are important. Let your child know that you appreciate how unpleasant it is but that you are proud your child is taking the medication as directed. By following these tips and doing so with love and encouragement, you can ensure that medication time is brief and successful, which means that your child can more readily experience the medication benefits.